If you are an approved Emergency Care & Safety Institute Education Center, you may want to purchase First Aid and CPR Guide with ECSI Course Completion Card. Based on the 2015 International Consensus Guidelines for Cardiopulmonary Resuscitation (CPR) and Emergency Cardiac Care (ECC), First Aid and CPR Guide, Seventh Edition is an excellent resource for action at common emergencies. This quick reference gives you the tools necessary to prevent and minimize injury, provide comfort, and maximize care until expert care arrives. This guide is perfect for anybody who wants quick, portable access to vital first aid and basic life support information in place of, or in addition to, taking a formal first aid or CPR course. 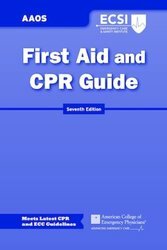 The First Aid and CPR Guide, Seventh Edition may be used within first aid and CPR refresher training courses offered through the Emergency Care & Safety Institute (ECSI). Please note, ECSI digital course completion cards are not included.